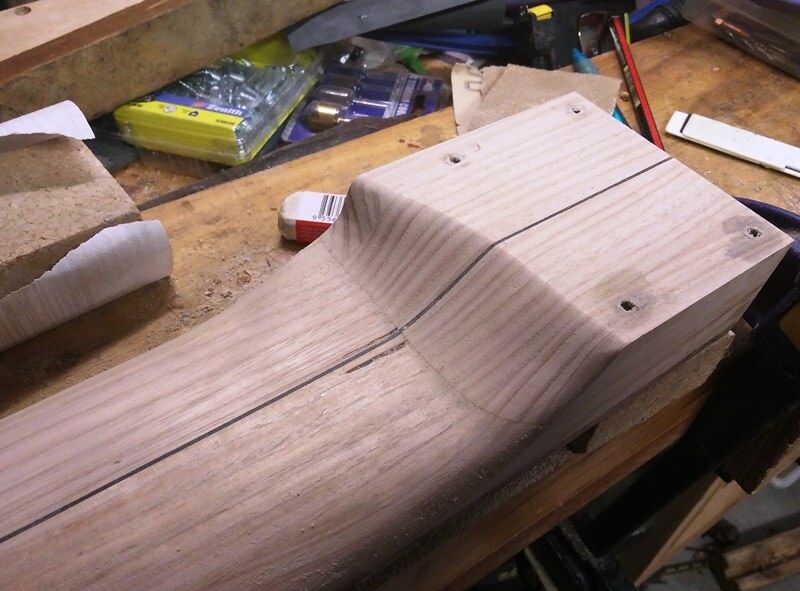 The more I look at this, Pete, the more I think I'd rather do a "traditional" 10 degree headstock design . Re dyes, well, I've been playing around with some aniline dyes (U-Beaut non-toxic, and dissolved in water). They seem to be rather suitable to what I want to do. I also have played around with the Osmo floor oil/wax products which come in a variety of colours, and they look promising as well. I suppose there are many different solutions out there ... .
Yeah, if I had my time again, I might do the same. 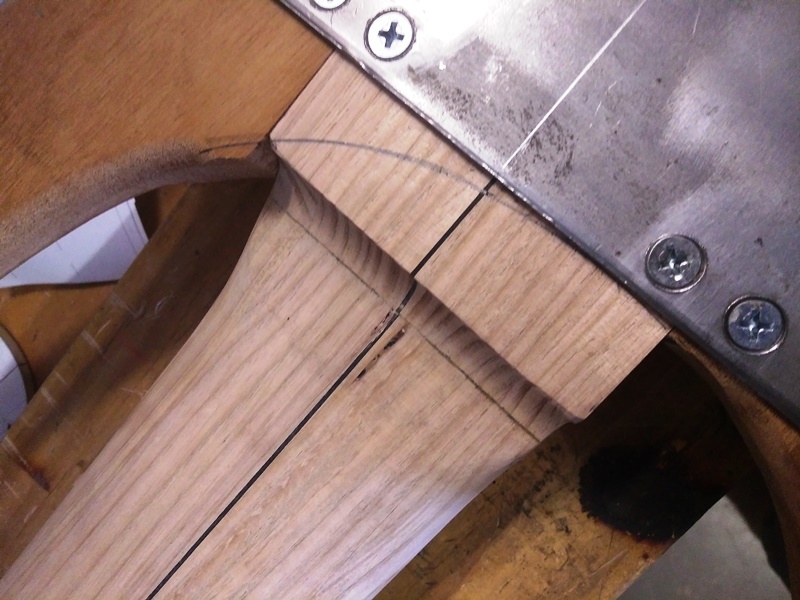 However, I was trying to see if I could produce an easy headstock with less machining/carpentry. On that score it is a lot easier. Time will tell if it works with regard to break angles and playability. Cheers, I'll look into them. I'm not far off getting the body all put together... which feels like a really weird thing to say. It's also a bit more complicated than you're average "bolt-on". Getting the bridge end put together will be the tricky bit. 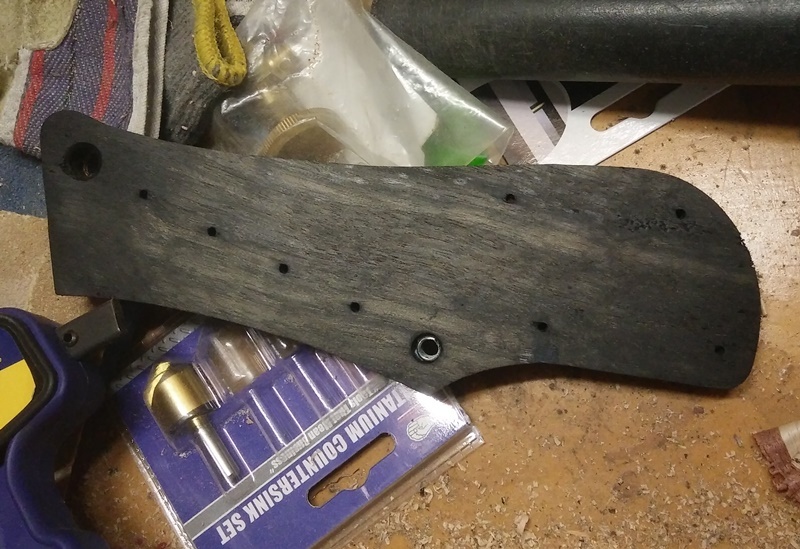 I put another coat of black stain on the headstock and then another. It doesn't seem to get any blacker than this. 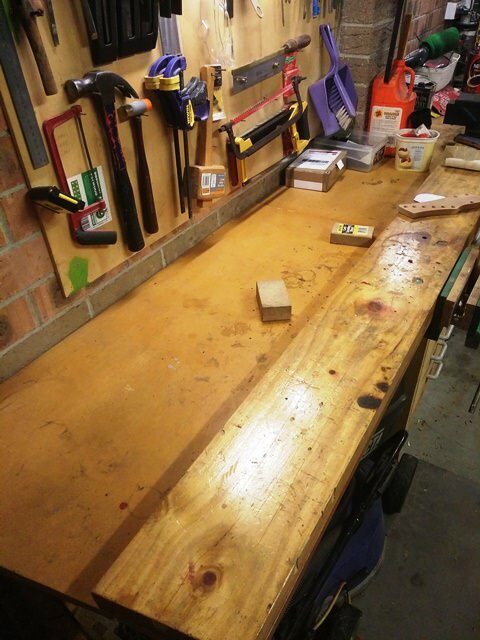 So I tried oiling it too with Danish oil. So, it's more slate grey or anthracite than jet black like I was hoping initially. Having side that, I don't mind the look of it. I'm still thinking about what I'll do with the body timbers. It's a wonder I got any of this done tonight. I went out to get some wood screws just before dinner and my wife called me to drop some pretty bad news on me. A work situation that has been festering for some time appears to be a LOT more rotten than I first imagined. Really, really sad stuff. Broken people behaving very badly. Tomorrow is my day off, but I'll need to deal with that situation first thing. Today wasn't a great day work-wise and neither was yesterday. If all goes well tomorrow, it will swallow most of the day. If it goes badly... I don't want to think about that. My younger son asked me tonight, "Hey dad, wanna play pool?" I replied, "Actually what I want to do is dig a hole and hide in it." He completely misunderstood and looked very enthusiastic, "Can I help you dig!?!" I groaned. Monoplane. Then I realized both the edges on the wings weren't straight I had to be... wait for it... planed. Then I put it back together. I have to say, I started to feel excited again. It is ludicrously light for such a big bass, although quite neck heavy without the bridge/PUs/tailpiece. 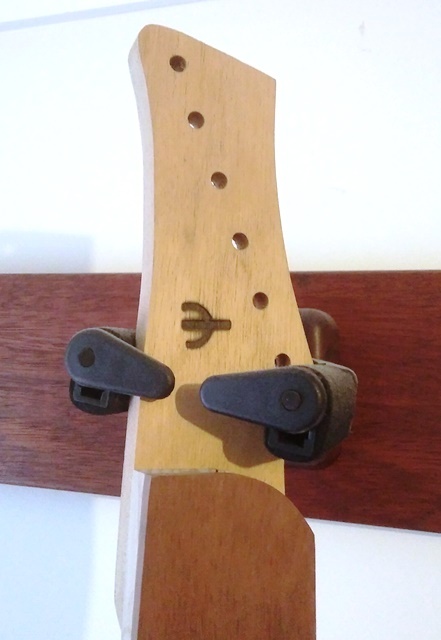 I realised the bolt on headstock could also be another place for an extra strap nut if it's needed. Leo would be proud of me. BTW, my wife looked at the blue stain. Two words. Not happening. After drilling (too many) holes and cutting down a heap of screws I got the bass together this morning. 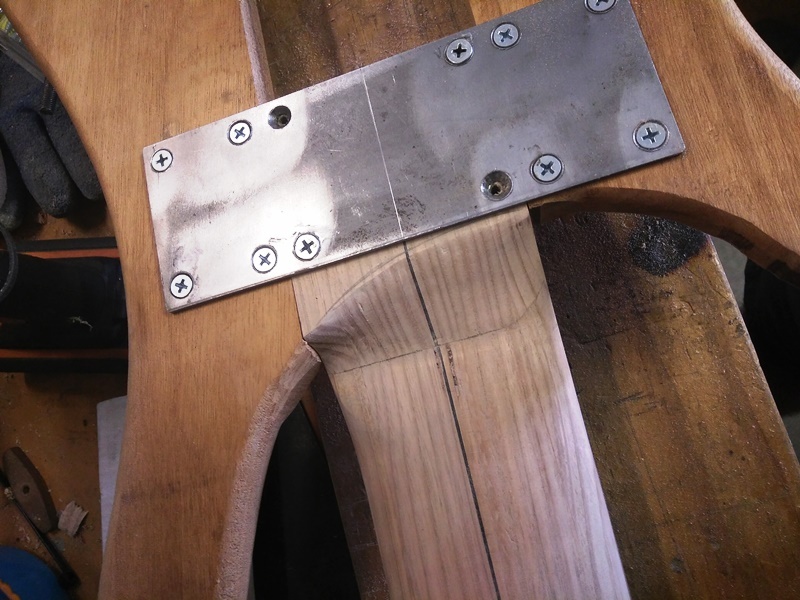 Having put the tailpiece1 on... I can't believe how long that tailpiece sat in my parts draw... I put the bass on my knee to check the balance. Thankfully, it seem reasonably neutral. It is just a touch neck heavy, but it still has some PUs and other junk to go on so we should be ok. I just put it on the scales and it's 3kg (6.6lb) as is. That's not bad really. Here's a pic next to my old dreadnought acoustic for reference. For some reason no one has offered to lend me a P-bass. One problem is the headstock. I had designed it with the expressed purpose of being able to put it in one of my wall hangers. Which is a bit of a fail. 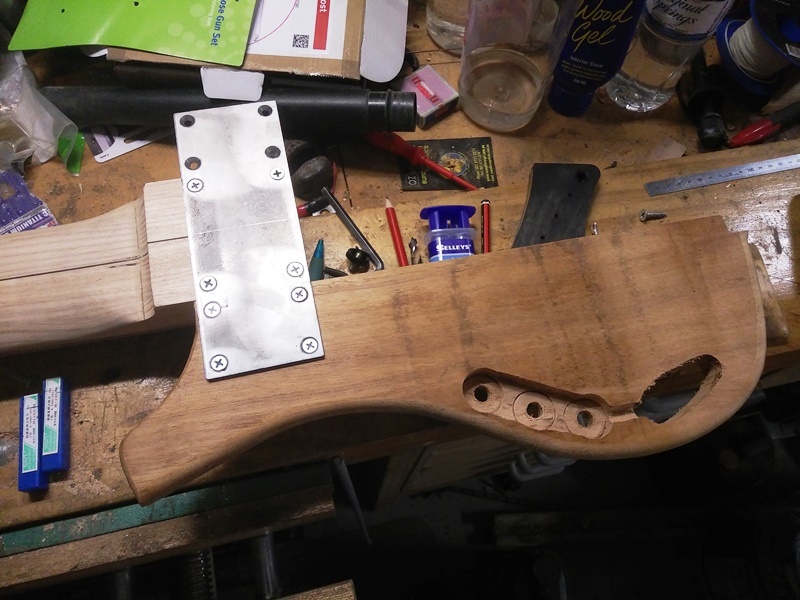 I think I can mod the headstock to fix that though. Should be pretty straight forward. 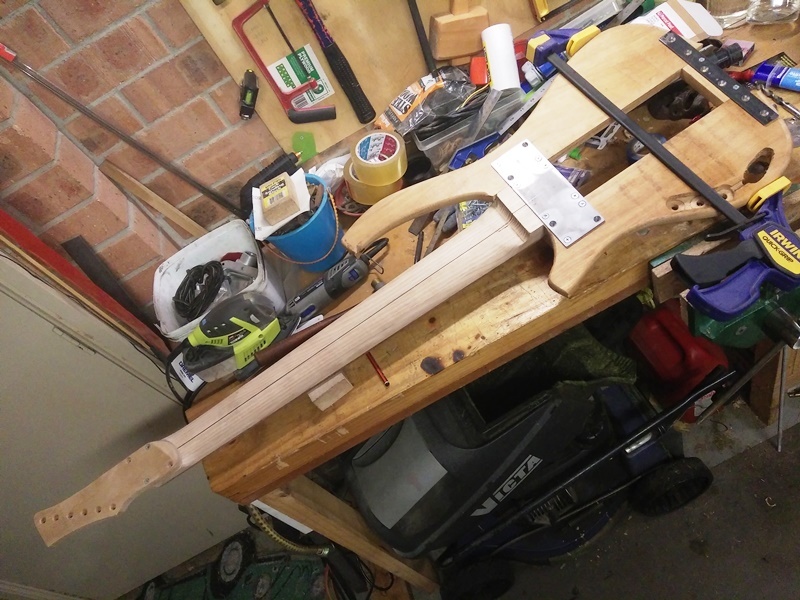 So with all that done, now begins all the work to tidy it all up it and get it ready for strings. Close but not right yet I think. It's a weird shape to try and form. I've been struggling with it. 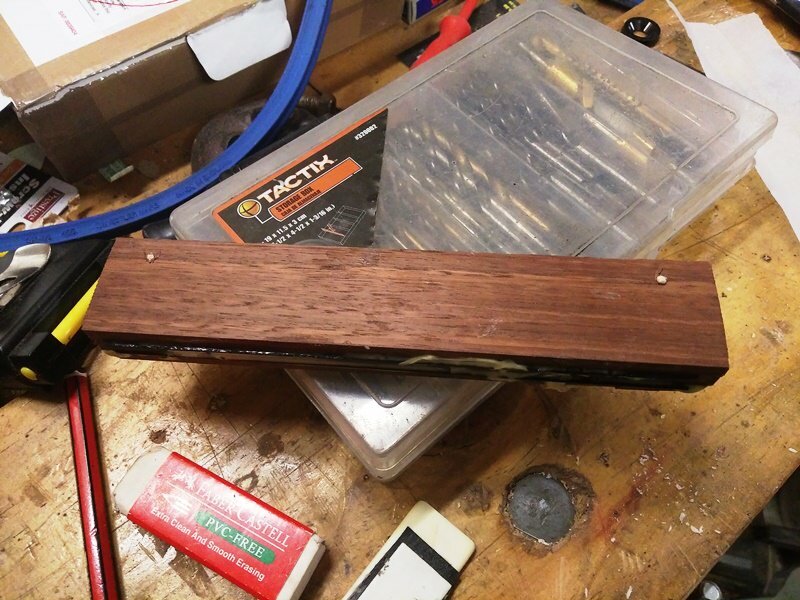 Glued up a laminated blank for the nut. 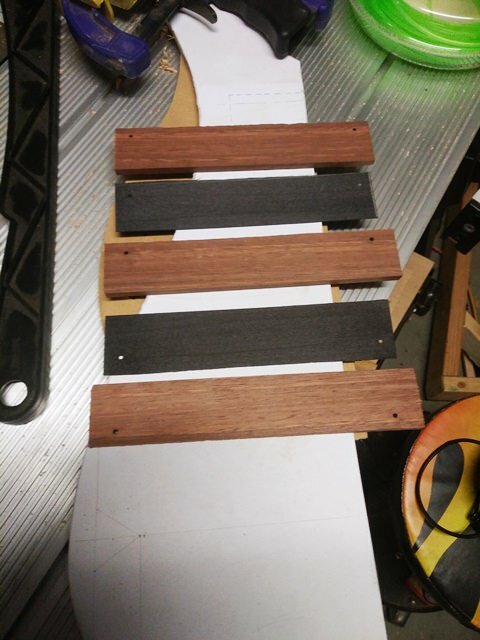 Old piano veneers and black dyed maple. are you going to remove or soften the arris on the metal plate ? They'll get a slight smooth painting. They're not that sharp as is. Some more tom-foolery this morning. In other news, after agonizing over finish colours, I've made a decision. I poured some naptha on the body timber today and it looks pretty good. It's somewhat like ash, only more yellow. So as boring as that is, I'll be going natural. The jarrah fingerboard also has a pretty wicked flame in it, so that's cool too. When I saw the first pic I thought you were going into the xylophone-building business. Anyway, I've been using plenty of Titebond myself in the last couple of days, and there's absolutely nothing wrong with that. Natural? Nothing wrong with that either. Managed to borrow these lovely old gouges from my father inlaw. 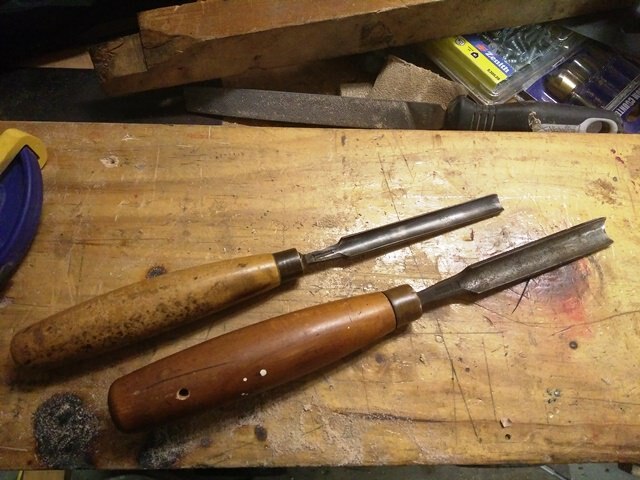 They're good old steel and sharpened up pretty well using a trick I used from Crimson Guitar. Then vigorous sanding with 80 and then 240. Across the grain and then with it. I'm pretty happy with that. Much better than before. I think I'll leave it like that. BTW, The stains around the screw holes are where I got a bit carried away with the soap on the threads. Nothing to worry about. 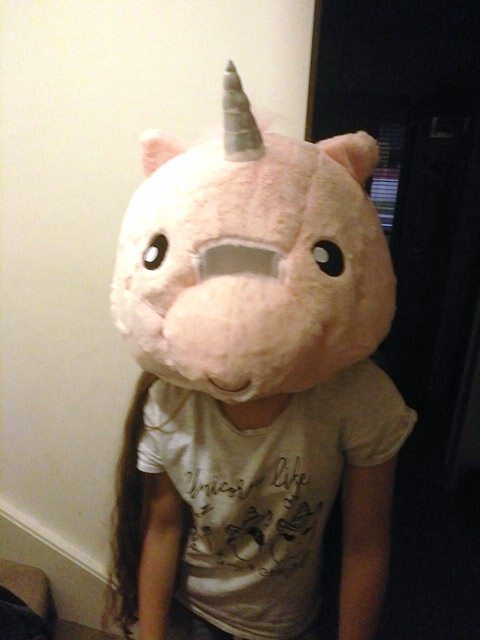 While I was doing this, a friend turned up with this for my daughter. I guess it was about 12 months of build up. I'm a "critical mass" kind of cleaner and it had well and truly got beyond a joke. 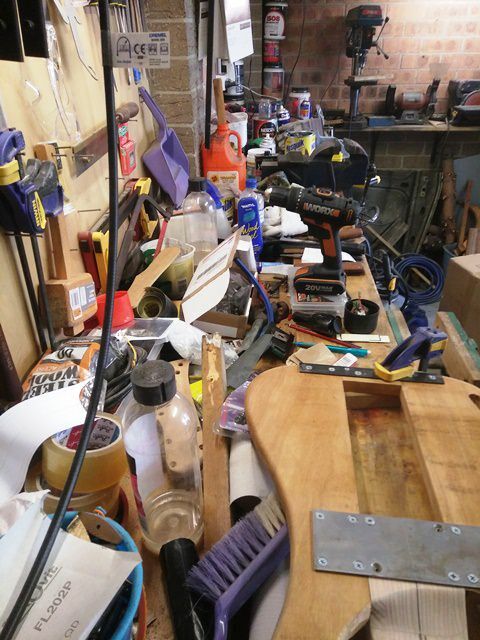 Much of what was taking up the bench space was odds and ends I didn't know what to do with. Some are now shoved into corners, but at least they're not cramping my bench space. I also installed a few more hooks and got certain tools off the bench. It's still probably only about 75% done, but by late this morning it was a lot better. 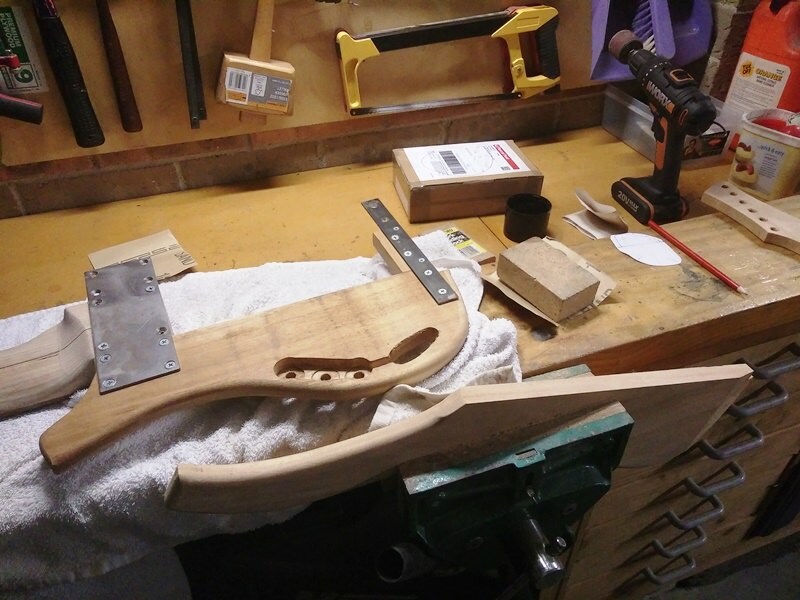 So I was able to spend some time matching the top body wing to the neck joint transition and then I started sanding. Oh man. I forgot about the sanding. And sanding. Then after that some sanding. I guess the top body wing is now about 80% there in the rough. I still have another wing to do. 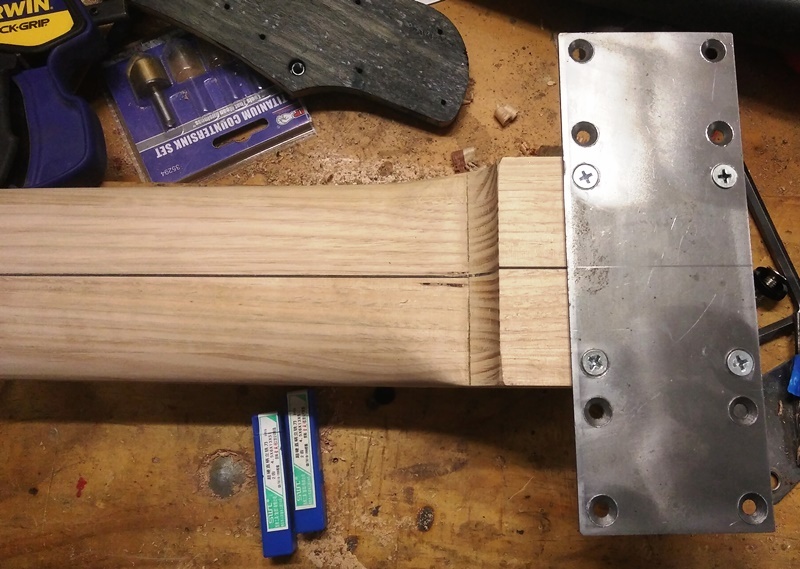 What really messed me up were a few roundover spots where the wood started to tear out. There's more of that on the other wing. 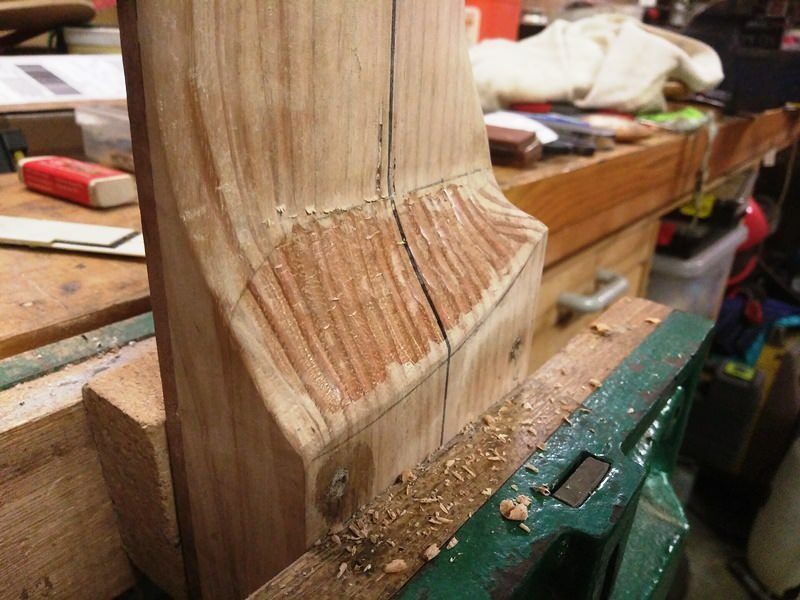 I think it's time to sharpen my router bits... or find softer wood. With school holidays, kids and various other things going on, I won't have another chance to touch the bass until late next week. 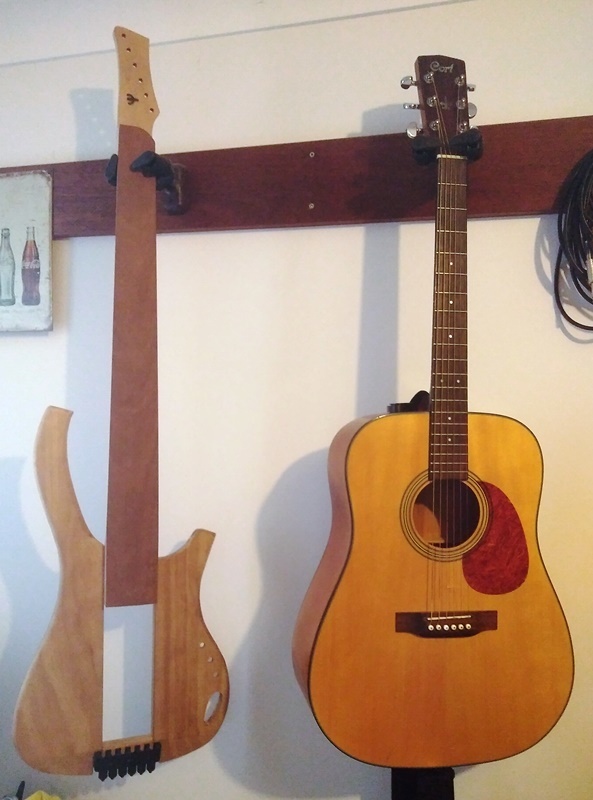 I'm still waiting on my second set of tapewound strings for the bass. They sent me a white set, but I really wanted black strings and Labella was taking ages to make them. Will have follow up bassstringsonline again I think. 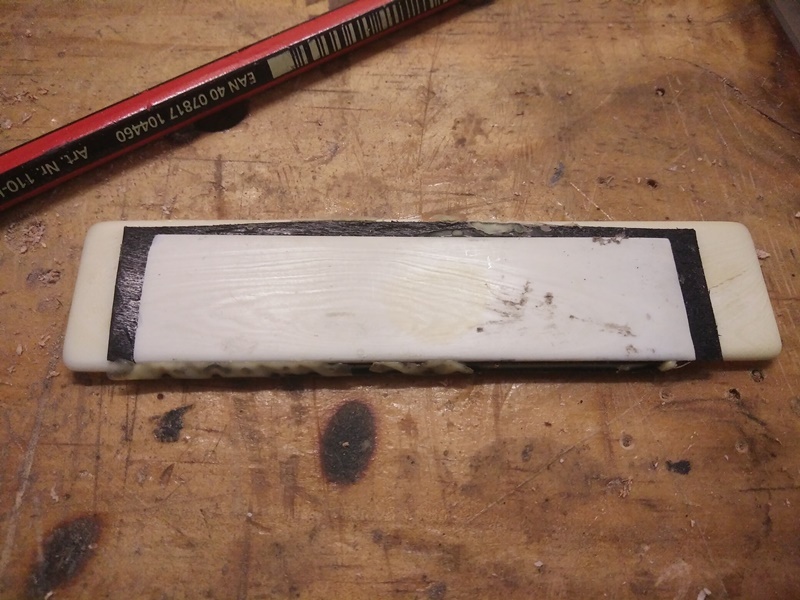 THAT looks so very familiar ... .
And thank you for reminding me to start thinking about sanding. And strings.